It's a great pleasure for me to give this reception tonight for the 'Chinese Bridge' contestants and your teachers, families and friends. Tonight would be a good occasion for me to speak in Mandarin. Yet I fully understand that some of you do not speak Mandarin or have only just started learning. So I will continue my speech in English. I want to encourage the families and friends of UK contestants to join the ranks of Mandarin learners. You may not win prizes in competitions like your loved ones. But by learning Mandarin, you would give even stronger support to your dear ones in their competition. And you would appreciate more our Mandarin events. I came up with the idea of hosting this reception earlier this year. The Education Section of the Embassy has been working on it for some time. I'm glad that today, as the competitions have drawn to a close, we are finally able to celebrate Chinese and British success. The annual 'Chinese Bridge' competition was created by Hanban in China. Since its start, over 800,000 students around the world have taken part in preliminary stages of the competition. This is a wonderful contribution to building cross-cultural understanding between young people from all around the globe. Let me now turn to the British success in this contest. Last month, the finals of the 10th 'Chinese Bridge' Chinese Proficiency Competition for Foreign College Students were held in China. I am delighted that the British team became a big winner in the competitions. I warmly congratulate the four members of the team, Peter Dolby, James Bilbow, Alexander Odahara and Adon Lawley. Respectively they won a first prize, two second prizes and a third prize. In addition, Peter Dolby was awarded the title of 'Chinese Language Envoy', and Alexander Odahara was named the 'most popular contestant' by Chinese internet users. A few months ago I gave a farewell message to this British team as they set off for China. I said that last year the British team had set a high challenge. This was Stewart Johnson's top prize in the 9th competition in 2010. This year's British team have certainly risen to the challenge. Theirs was the best performance Britain has ever achieved in the 'Chinese Bridge' contest. Their success this year is a superb achievement. Their win provides a shining light on the excellence of Mandarin teaching in Britain. As such, perhaps I may suggest the prizes belong to all Mandarin learners and teachers in this country. 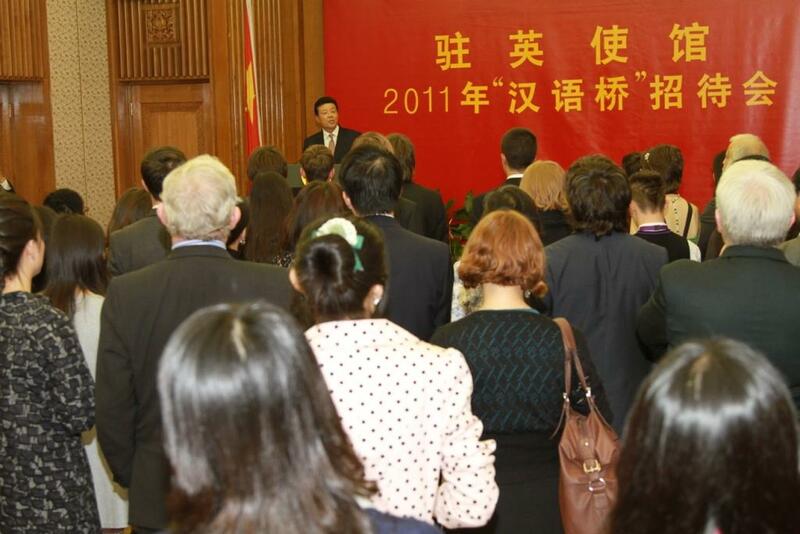 The success and prizes are a symbol of the progress in boosting the teaching of Mandarin in Britain. So my sincere congratulations to all British students and teachers of Mandarin! Today's event is first and foremost to celebrate your winning these prizes. Second, we are here to wish you more victories! In addition to university students winning prizes, Mandarin students in primary and secondary schools are also doing extraordinarily well in the 'Chinese Bridge' competition. We have seen more of them join this contest. And equally striking is that their performances are getting stronger year by year. 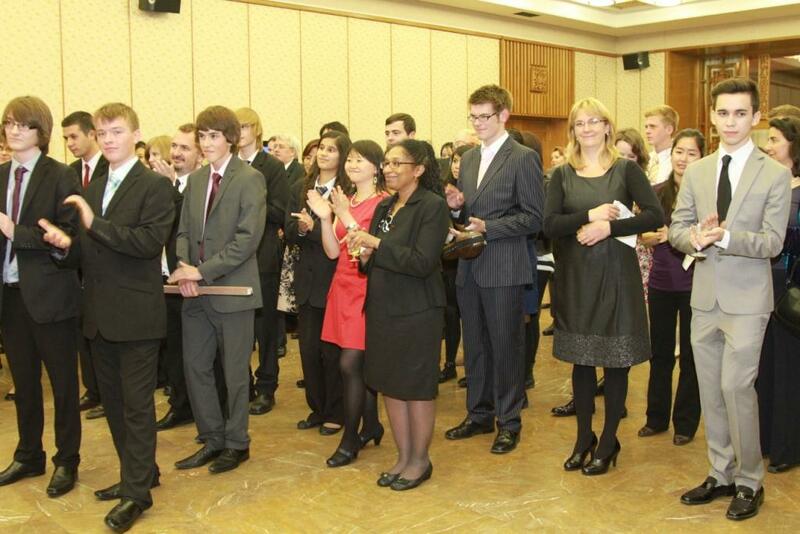 Last year, Harry Randall from Wellington College won a prize for the best individual speech. This year's competition for secondary school students is just around the corner. I am told that the team selected to represent Britain in 2011, the Calday Grammar School, is preparing with great vigour. I wish these school contestants every success! Third, our gathering tonight is a thank-you reception. We Chinese have an age-old tradition of respecting teachers and valuing education. So the Chinese custom is for part of the credit for students' success to go to their teachers. In this spirit, let me thank the leaders and faculty of the Confucius Institutes and Confucius Classrooms. Also, I must thank all those Mandarin teachers who have worked so hard and so long with their students in universities, secondary and primary schools up and down the country. Across Britain, I am much encouraged to note the growth of Mandarin teaching. It is clear Mandarin learning is gaining wider popularity in Britain. The evidence is that there are more Mandarin teachers and learners every year. This enthusiasm for learning about China means that around 100,000 British people are learning Mandarin. As I speak, over 500 secondary and primary schools teach Mandarin. Some schools have even put Mandarin on their curriculum as a compulsory course. Meanwhile, Mandarin courses are taking a more prominent position in higher education. Mandarin is now available in 54 UK universities. I am particularly pleased to note the progress at Durham University. Over many years this university has trained so many excellent Mandarin learners. After a break of some years it is excellent news Durham has decided to enrol Mandarin 'major' students again in October this year. After 6 years of expansion, the numbers of Confucius Institutes and Confucius Classrooms have risen to 17 and 57 respectively. This growth is putting Britain way ahead of any other European country in Mandarin teaching. · I believe they should strengthen the sustainability of the foundations established. · In turn this will provide a platform to provide higher quality courses and so expose every more people to the Chinese culture and language. As we celebrate this expansion and success, let us give thought to the families and friends of students. My deep thanks go to the families and friends of the young students, especially those of you with us today. I'm sure your support and encouragement to Mandarin learning is a key factor in the progress and success we are witnessing among the students. I believe that the study of Mandarin may also advance the careers of British students. The evidence is in a recent survey reported by the The Financial Times. This survey found that many FTSE 100 companies seek to hire senior executives and board members with a China background and knowledge of Chinese language and culture. This is a clear, encouraging signal that should give you confidence in your choice of Mandarin study. Your hard work will be rewarded one day. Last but not least, our gathering tonight is a welcome reception. Learning Mandarin in Britain is merely the first step. To see China as it is, I believe a study experience in China is a must. China today is so vibrant and it changes so fast. Without first hand observation, it's difficult to feel China's development and what this means to world. Without visiting China it's even more difficult to understand why China has taken a path that fits in well with its realities, which is a path of peaceful development. Tonight, I regret that Peter Dolby and Stewart Johnson are not with us at the reception. Yet I am pleased that both of them have begun to study in China. I'm sure we will hear more such stories, because more opportunities will be offered to foreign students. 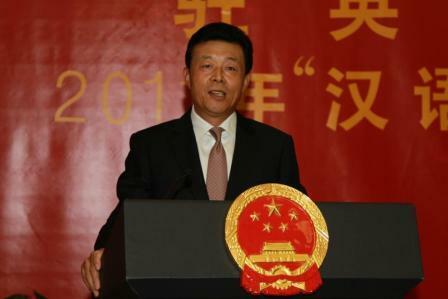 To facilitate this process, this year, the Chinese government unveiled its Study in China Program. This is a strategy that aims to encourage more international students to be educated in China over the next ten years. By 2020, China will host 500,000 international students every year. That's more than any other country in Asia. · and strengthen support services. In addition, more scholarships will be available to students from the rest of the world. We welcome more and more British young people to China to study. We want them to explore Chinese cultural heritage and experience China's immense appeal today. Last March, I joined His Royal Highness The Prince of Wales at the official opening of the Confucius Classroom at Llandovery College in Wales. Likewise, I have a message for all those in Britain studying Mandarin and with an interest in China.